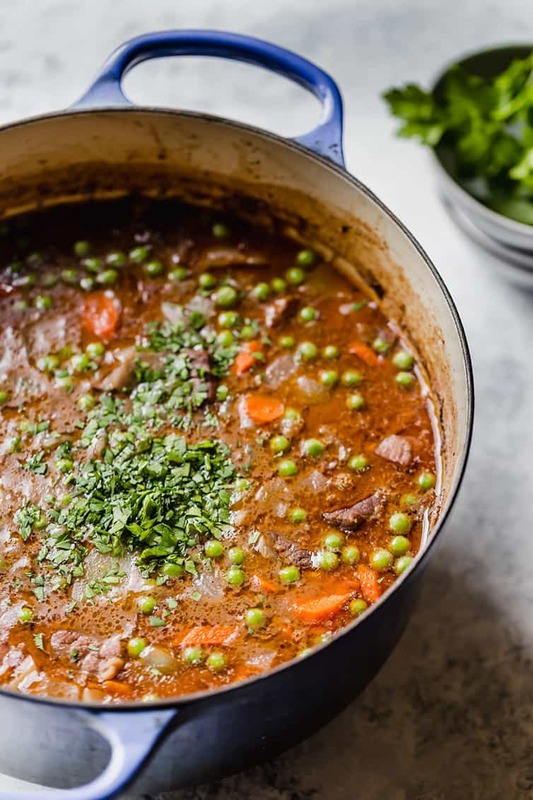 This easy beef stew recipe is cooked in the oven for maximum flavor concentration and ultra tender beef. The addition of carrots, potatoes and peas make this a hearty one-pot meal. All you need is some crusty bread and softened butter for a complete dinner. Beef stew always reminds me of having fall and winter dinners at my Grandma’s. 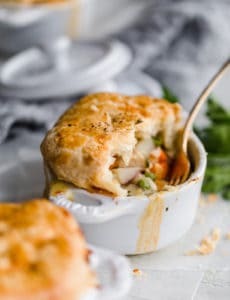 She would make a dish similar to this and I would make sure to fill my bowl with gravy so that I could soak it up with lots of bread! Stew is definitely a comfort food for me, and with the cold weather here to stay for awhile, now is a great time to whip up a pot. 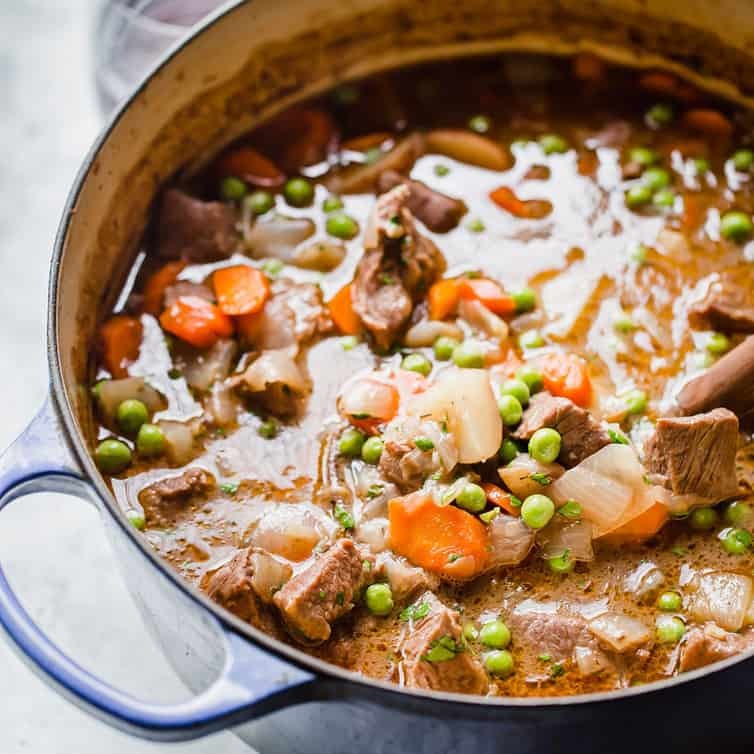 This recipe produced the classic flavors that I always associate with stew, and the meat was beyond tender – absolutely perfect! Beef chuck roast, preferably a cut that is well-marbled (more fat = more tender!). Onion and garlic for a big punch of flavor. Tomato paste adds a richness to the sauce and the acidity helps to break down and tenderize the meat. Flour to thicken the sauce. Red wine for additional flavor and body to the sauce. Chicken broth. Yes, chicken! Why? If you have homemade beef stock, use it! However, most commercially produced beef broths taste rather fake; chicken broths are much richer and complex. Bay leaves and thyme – Aromatics for more flavor! Carrots, potatoes and peas are the staple of a traditional stew. Now, let’s talk about HOW to go about making this stew. When I made the first iteration of this recipe, it was simmered on the stovetop. I mean, it was fine, but it wasn’t oh-my-gosh-fantastic. I wanted fan-freaking-tastic beef stew, so I started experimenting. One of my very favorite stews, Guinness Beef Stew, simmers uncovered in the oven, so I went that route. It was an absolute win again. You’ll notice that unlike many other beef stew recipes, I don’t sear the meat first. I did this at first, but found that by cooking in the oven uncovered, the exposed meat got a psuedo sear, and, even more importantly, this lets the sauce evaporates a bit, thereby thickening it and concentrating the flavor. 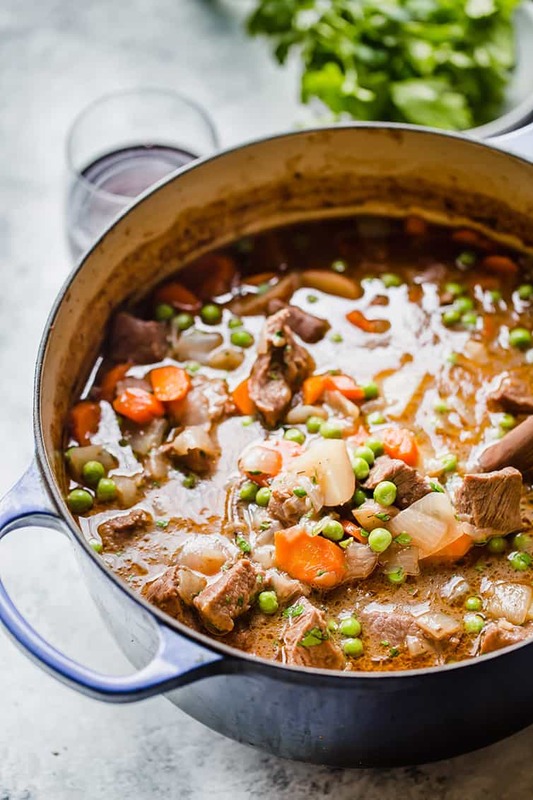 A few quick notes to ensure you make the absolute best stew possible! Look for a beef chuck roast that has nice marbling, as it will be more tender. Cut the meat in uniform pieces so it cooks evenly, and don’t cut them too large. I like to use a dry red wine for this stew, I usually grab a cabernet sauvignon. Other good options are merlot, pinot noir, or shiraz. You can omit the red wine if you don’t drink alcohol; replace with additional broth. Feel free to substitute other favorite vegetables if you’d like. To make this in a slow cooker, you will ideally sear the meat since you won’t get that exposed heat from the oven. Do that first using a couple tablespoons of oil, then transfer the meat to the slow cooker. Next, saute the onion, garlic and tomato paste as directed below, then deglaze the pan with the wine. Transfer all of that to the slow cooker. Add the broth, bay leaves, thyme, carrots and potatoes and cook on low for 8 to 10 hours. 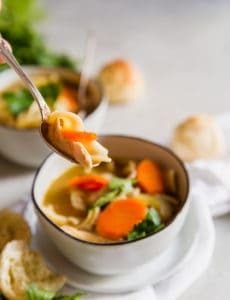 Whisk 1/2 cup flour with 1/2 cup broth and stir into the stew mixture, turn the slow cooker to high and cook for 10 to 15 minutes, or until thickened. Then proceed with stirring in the peas, parsley, salt and pepper to taste. So there you have it! After many, many attempts at trying to create the most flavorful stew possible with a sauce thick enough to to stand up to multiple dips of bread, I finally nailed it. 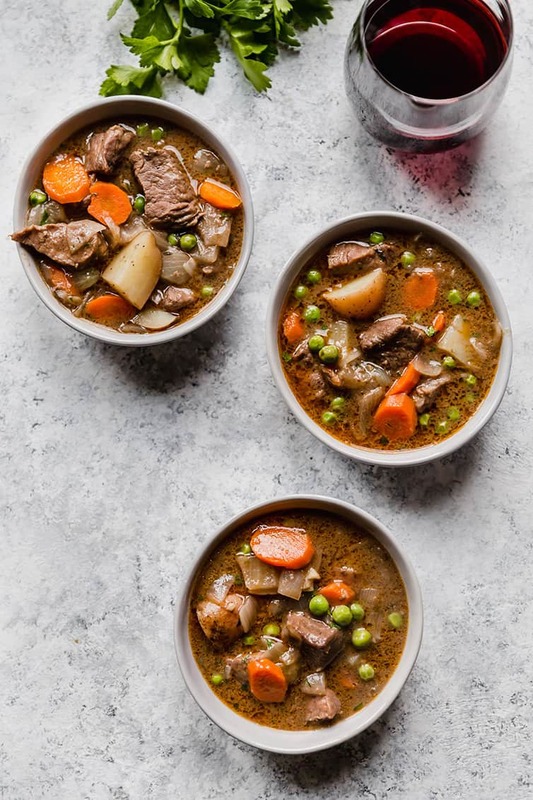 Once we hit fall and winter, there is nothing quite better than a big bowl of something warm and hearty, loaded with meat and vegetables, and this beef stew absolutely fits the bill. Enjoy! 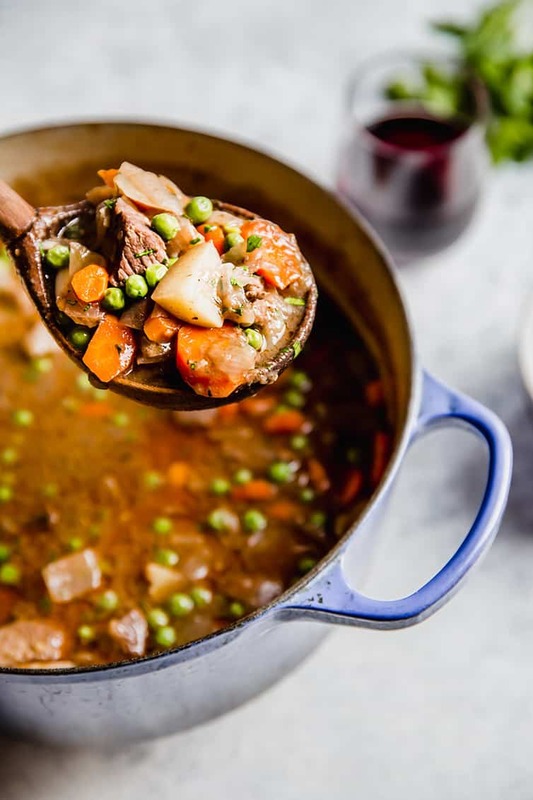 This easy beef stew recipe is cooked in the oven for maximum flavor concentration and ultra tender beef. The addition of carrots, potatoes and peas make this a hearty one-pot meal. Adjust oven rack to lower middle position and preheat oven to 325 degrees F. Season beef cubes with salt and pepper. Heat the vegetable oil in a Dutch oven over medium-high heat, add the onions and cook, stirring occasionally, until tender and golden brown, 8 to 10 minutes. Reduce heat to medium, add the garlic and tomato paste and cook until fragrant, about 1 minute. Stir in the flour and cook until lightly colored and no raw flour remains, about 1 minute. Add the wine, scraping up any browned bits stuck to the bottom of the pan. Add the chicken broth, bay leaves, and thyme. Bring to a simmer and cook until slightly thickened, about 3 minutes. Stir in the beef and return to a simmer. Transfer the pot to the oven and cook, uncovered for 90 minutes, stirring halfway through cooking. 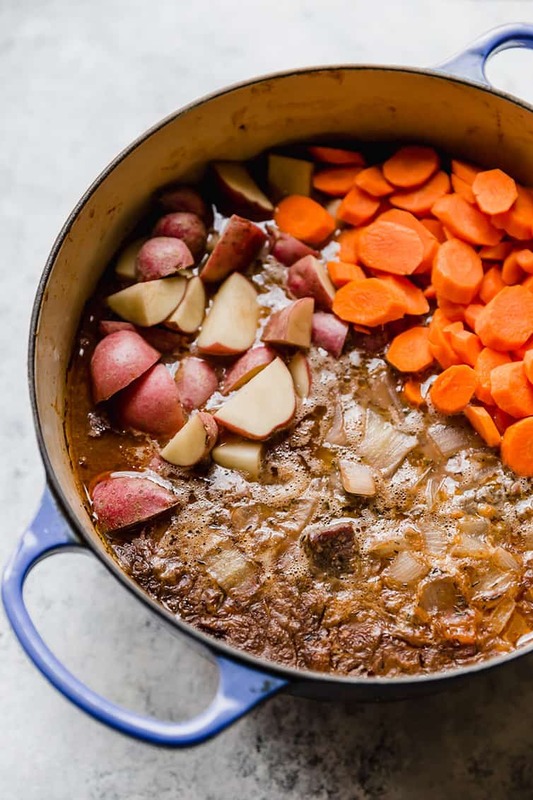 Remove the pot from the oven, stir in the carrots and potatoes and continue cooking until the beef and vegetables are tender, about 1 hour, stirring halfway through cooking. Remove the pot from the oven, discard the bay leaves, add the peas, and allow to stand for 5 minutes. Stir in the parsley and season with salt and pepper to taste, then serve. 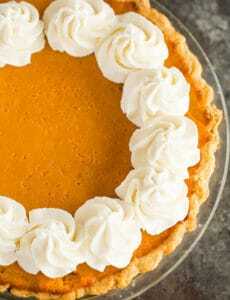 Leftovers should be stored in an airtight container in the refrigerator for up to 3 days. Look for a beef chuck roast that has nice marbling, as it will be more tender. Cut the meat in uniform pieces so it cooks evenly, and don't cut them too large. You can omit the red wine if you don't drink alcohol; replace with additional broth. Feel free to substitute other favorite vegetables if you'd like. To make this in a slow cooker, you will ideally sear the meat since you won't get that exposed heat from the oven. Do that first using a couple tablespoons of oil, then transfer the meat to the slow cooker. Next, saute the onion, garlic and tomato paste as directed below, then deglaze the pan with the wine. Transfer all of that to the slow cooker. Add the broth, bay leaves, thyme, carrots and potatoes and cook on low for 8 to 10 hours. Whisk 1/2 cup flour with 1/2 cup broth and stir into the stew mixture, turn the slow cooker to high and cook for 10 to 15 minutes, or until thickened. Then proceed with stirring in the peas, parsley, salt and pepper to taste. Update Notes: This recipe was originally published in October 2007. It was totally overhauled and updated in January 2018 with new photos, a video and additional recipe information. 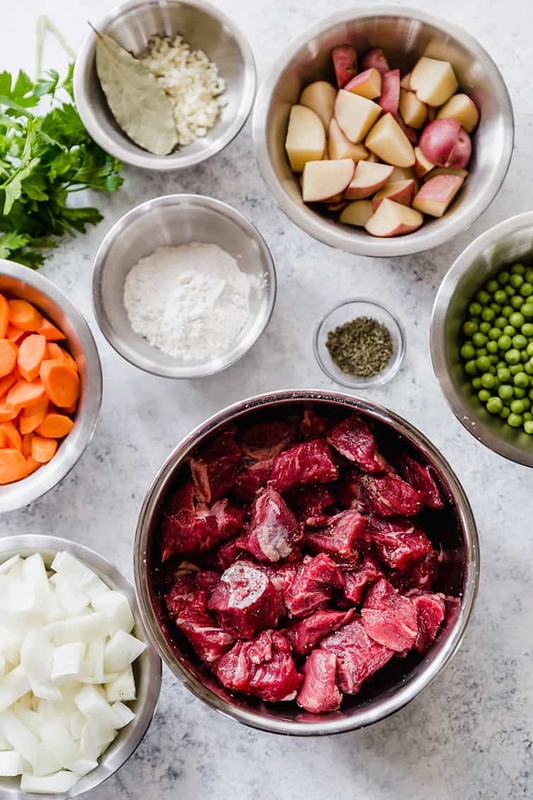 I love to make beef stew and I can’t wait to try this one!!! What flour would you recommend trying if you wanted to make this gluten free? Any gluten-free flour should work! Thanks for a delicious recipe! I followed it to a T and it was so good, I’m already thinking about the leftovers! It really got nice and thick as it baked and the meat was tender and browned nicely. It will now be my go to stew recipe. Made this for dinner on this chilly day. It was so hearty, rich, and delicious. It takes some hands-off time slow cooking in the oven, so prepare for that. The house smelled reeeally good as this cooked on the oven. This is my new go to beef stew recipe. Had homemade buttermilk biscuits on the side. Delicious!